Micro needling is a non-surgical skin therapy, often also referred to as Collagen Induction Therapy (CIT) or Derma Roller. The treatment works by creating a controlled injury to the skin’s surface, which encourages the body to naturally heal itself and form new skin. Very fine needles are used to create the injury. The appearance of various skin conditions is reduced as the new skin forms, leaving the skin looking fuller and brighter. eDS Dermal Stamp or Roller? We use two different devices the eDS Dermal Stamp and the Dermal Roller that both use thousands of very fine needles to gently puncture the skin’s surface. The difference is the Roller treats larger areas and the Stamp treats a smaller area, often where the Roller can’t reach. However, both Leave the skin looking smoother, brighter, younger and healthier-looking, once the skin has healed. And the new layer of skin has naturally formed. In most cases, the skin will begin to heal the same day. Your Micro Needling procedure will be performed under clinical conditions in one of our treatment rooms. We will begin by administering anaesthetic (that takes circa 30 minutes to work) to ensure your comfort throughout the experience. The Aesthetician will then use either the Genuine Derma Roller or the eDS Dermal Stamp with their thousands of micro needles over the treatment area. The micro needles puncture the dermis of the skin, this encourages the body’s natural healing process, reducing the appearance of the scarring. 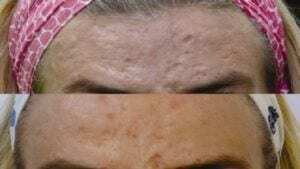 The adjacent picture shows the effect on the skin during treatment, the skin starts to recover in most cases on the same day. Once the actual procedure is complete, you will begin the recovery period. This is a critical part of the process because it’s when fresh skin grows in to reveal your new and improved complexion. As such, you’ll be provided with detailed instructions on how to care for your skin during this time to ensure optimal results. The length of your recovery period will depend on the severity of your acne scarring and the invasiveness of your treatment. During your initial consultation, we will review all of these factors with you, so you know exactly what to expect. With that said, most patients will require a recovery period of a couple of days to several weeks, during which time the skin may appear pink, red and irritated as it heals.